An outdoor pool indoor hot tub and free Wi-Fi appeal to our guests at the Travelodge in Winchester. Each of the 145 spacious rooms at the two-story Travelodge includes a coffeemaker mini-fridge and cable TV with premium channels. Wi-Fi is free throughout the hotel. When it's time to relax feel free to lounge by the seasonal pool or take a dip in the indoor hot tub. Same-day laundry and dry cleaning services mean there's no excuse for not looking your best. Work travelers enjoy the business center and meeting space. Pets are welcome with fee and parking is free. 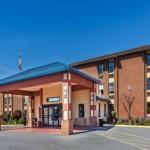 The Travelodge is near to I-85 within walking distance of Shenandoah University and the Apple Blossom Mall. The shops and restaurants of downtown Winchester are within minutes. Wilson's Wild Animal Park is five miles away. Winchester Regional Airport is two miles from the hotel and Washington-Dulles International Airport is 50 miles away.